I was just coming here to ask why you hadn't changed the background to Liturgical Purple when, voila! Liturgical Purple. My mom wanted to name me Joshua or Nicholas, but a few weeks before i was born, my parents saw a spanish movie about St. Martin de Porres and my dad really liked the name, so I was named Martin. i wish i knew the name of the movie; parents dont remember it either. btw, father, i hope you dont mind, i posted one of your homilies on my blog a couple of weeks ago. I'm not up to par on blog etiquette, but i did link it back to you. i read about a half dozen priests blogs, and your homilies are outstanding. have you published? This is the only publishing I do. but still, protect them all night long." 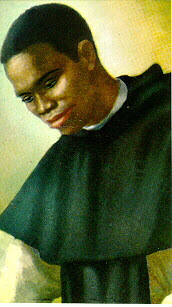 The question about a movie about St. Martin de Porres came up last year. this is what I came up with. That link to Father's site last year works fine, but one of the links THERE is outdated. If you want to go to the all-in-Spanish Laguna Films Web site, here is the page for TEARS OF ST. MARTIN DE PORRES. my absolutely favourite saint too Fr. My nan had a great devotion to him 7 i've passed it on to my children..i never failed an examination..even a prayer to pass your driving test..i passed first time..St Martin De Porres Pray for Us. RE: Color. I am glad to know nothing is wrong with my monitor! Happy Advent!